Sculptural hedges create a focal point for the garden for this new property in Cheshire, framing a piece of art work and the trees beyond. Before this is a large formal lawn with limestone stepping stones over a long reflective pool. 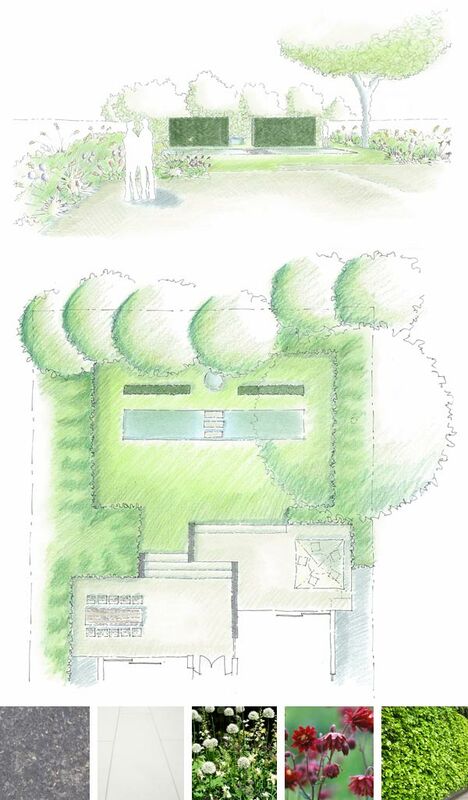 Wide borders enclose the garden and frame the terraces. Drifts of grasses and perennials provide texture and movement throughout the seasons. A pale sawn limestone is used for the terraces stepping up to the house, while low walls, in a contrasting split face blue limestone, link indoors and out. Subtle lighting creates a pleasant atmosphere in the evening for entertaining, and allows the garden to be enjoyed from behind the glazed sliding doors.